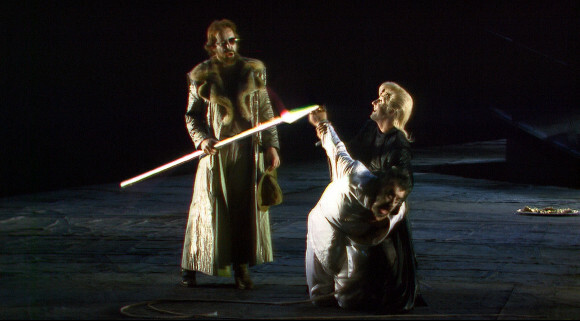 The 1991 Bayreuth Ring cycle is one of those productions that has become a historical landmark, as much as Chereau and Boulez’ 1976 effort, or maybe even more so. For many people it is the Ring. So what is it like? The staging is very bare and much reliance is placed on effects like lasers and smoke. It also makes considerable acting and athletic demands on the singers. It is, in many ways, a very modern production for 1991. 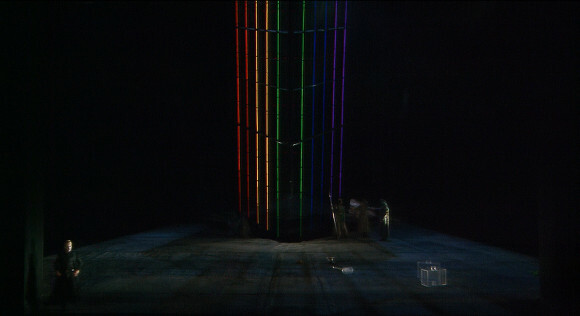 Das Rheingold opens with a laser light display which reads on Blu-ray as a sort of Toxic Avenger green. Apparently in the house it was a somewhat less bilious hue but, whatever, I rather like it. The Rhinemaidens sport and play on some sort of virtual surface that they can disappear into. I have no idea how this was done but it’s very effective. It really does look quite aquatic. It helps that the Rhinemaidens look the part and are genuinely athletic] something which seems to be a feature of this production. 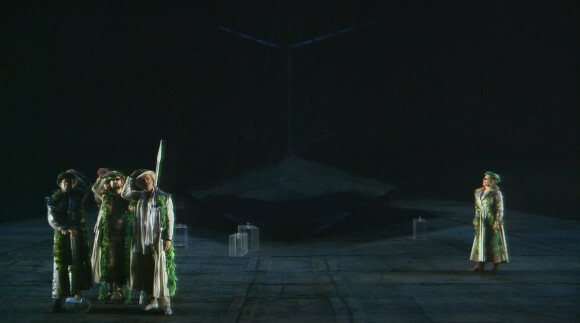 In Scene 2 we get to see John Tomlinson’s Wotan for the first time. He is really good. It’s unusual for a bass to sing the role but he’s got the notes and is surprisingly lyrical plus power to burn. 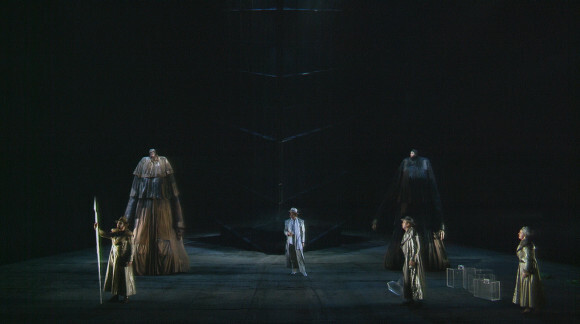 The giants, when they appear, are pretty spectacular; maybe 15 feet high and sort of wheeled around. Apart from that, there’s not much to see in the realm of the gods. It’s all very spare with a few props, like Donner’s hammer, that are transparent. 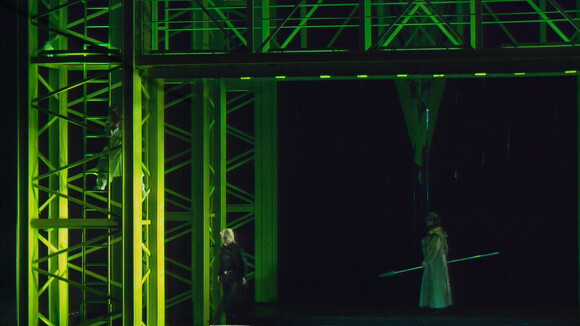 Nibelheim is a sort of gantry like structure in the same toxic green as in Scene 1. It’s here we really get to see Graham Clark’s very well sung and finely characterized loge and more of Günter von Kannen’s equally excellent Alberich. The tricky Tarnhelm scene is brought off well. Scene 4 may be a bit weaker. Valhalla is just bunch of rainbow light bars and there’s a lot of weird capering around by the Gods. Nonetheless the singing and acting continues more or less uniformly strong. I’m going to leave talking about Barenboim’s conducting until I’ve seen more of the whole work. Technically this is a really interesting effort. It was recorded in analogue HD (1250 lines) and genuine surround sound with ambient mikes around the theatre. This has been converted to digital 1080i picture and DTS surround sound. They are both remarkably good for a 1991 recording. Horant H. Hohlfeld’s video direction helps. It has more in common with the best modern recordings than TV recordings of it’s era and really shows the production as one might have seen it at Bayreuth. There are a few artefacts of the technology; the colour shift alluded to earlier with the lasers and some distortion of the laser effects in the first half hour or so of the production. This latter was apparently caused by the lasers interfering with the electronics of the video cameras! This whole Ring cycle is packaged very compactly with the whole thing fitted on four Blu-ray disks in a slimline box (it’s budget priced) and the booklet (for all four operas) is brief and to the point with not much more than casts and track listings. The Rheingold disk though does have a bonus in the form of interviews with Barenboim and Tomlinson which are well worth a look. Subtitle options are German, English, French, Spanish and Italian. I’m looking forward to seeing the remaining three installments. This entry was posted in DVD review and tagged barenboim, bayreuth, blu-ray, clark, hohlfeld, kupfer, tomlinson, von kannen, wagner by operaramblings. Bookmark the permalink.